A Mount Maunganui-based boat design company, Hall Marine Design, has been crowned as a finalist in the consumer category at the 2017 Best Design Awards. Hall Marine Design was born out of sunny Mount Maunganui in 2007 as a way to bring fresh, innovative designs to a marine industry that had become saturated with the same old, same old. Its Purekraft boat range was recently rebranded by award-winning regional branding agency WOODS and is like the IKEA of boats, offering kitsets (DIY builds), hull only (you add the componentry) or completed vessels. The kitset boats are sent flatpacked to save on shipping costs, reduce wastage and are easily constructed from scratch. These savings are then passed along to the customer, saving them thousands of dollars. The parts to the boat are cut by a CNC router machine, with ink markings to show where parts meet and should be welded. A comprehensive instruction manual is also provided. The result is a beautifully designed vessel that appeals to DIY types. CEO Jarrod Hall says Hall Marine Design’s products combine form and function in a way the New Zealand boating industry hasn’t seen before. He says boats are often designed to suit one specific activity, whereas the Purekraft design allows for everything from fishing, to entertaining with friends. “We strongly believe the way people use boats recreationally, crosses many different user requirements,” he says. Hall Marine Design’s Purekraft 550 Centre Console boat model has been nominated for a Best Design Award in the Consumer category. Despite being small in size, the 550 Centre Console’s design includes a back rest that can be forward or rear facing and fold away to make way for a cockpit table that can be used for entertaining and a cooler bin for food and drinks. There’s also dive bottle storage and a concealed pull out ladder, while the hull has been architecturally designed. Hall says the team at Hall Marine Design is “stoked” to have their hard work acknowledged with a Best Award nomination. The Hall Marine Design team isn’t sitting still after being announced as a finalist either. 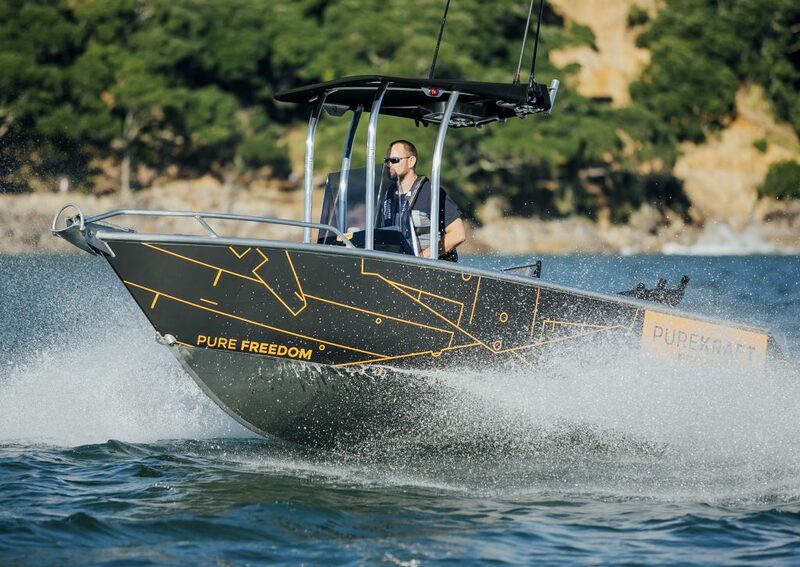 There are new Purekraft models in the pipeline, with a brand-new Purekraft 650 Cross Cab model planned for release at the Auckland on Water Boat Show in September. The Best Awards will be held October 6 in Auckland at the Viaduct Events Centre. For more information read about the Design Awards here.